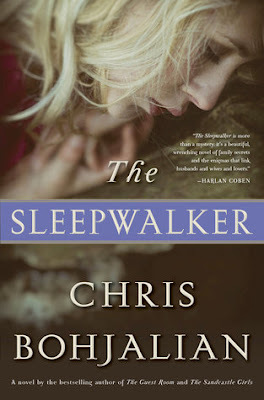 I always look forward to a new book from Chris Bohjalian because I know that I am going to get a real reading experience and The Sleepwalker was another fantastic book by this author. It's a fantastic story full of twists and turns that will keep you turning pages to get to the end while, at the same time, you are savoring the story and hoping that it won't end. Once I started, I couldn't put it down and I am sure that I'll be sleepwalking through my day today because I was up most of the night finishing it. Annalee has gone missing and her family fears the worst. Leanna and Paige, her two daughters, and her husband were aware that she was a sleepwalker and that she had left the house in the past when she was sleepwalking. The daughters call their father, who is away on a business trip, and the police when they realize that she isn't in the house. The police immediately start a search of the nearby woods and river. They don't find Annalee but they also don't find her body so no one knows if she is dead or alive. I can't say much about the plot because I don't want to give any spoilers. I thought that the best part of the book were the characters of Leanna and Paige. The girls were very real in their grief and confusion and their need to make sense out of their mother's disappearance. As with Chris's earlier books, he is one of the few male authors who writes fantastic and very real female characters. This is another fantastic book by a terrific author. Clear your calendar when you start this book because you won't want to put it down.